Most people should not consider going to music school. But if you have a conviction which cannot be dissuaded, and unshakeable perseverance, it might be for you. 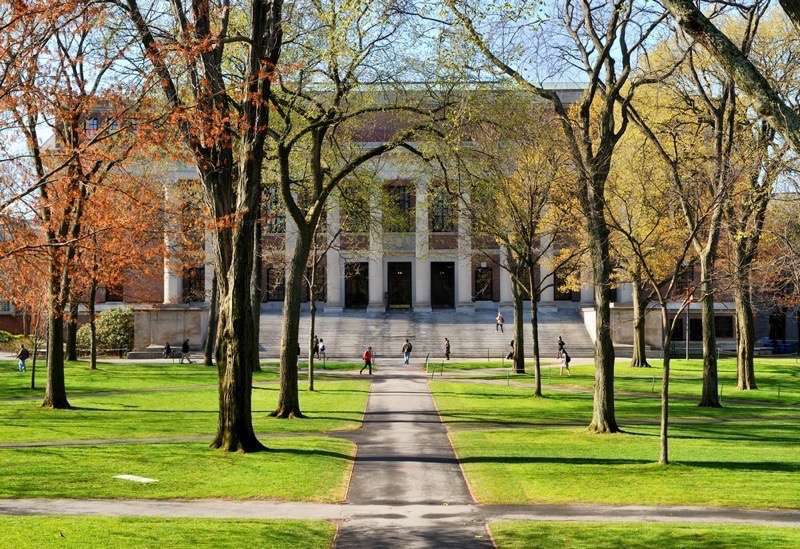 Excluding the wealthy and privileged, whose affairs are beyond the scope of this commentary, the factor most people are using to compare college educations is economic outcomes. Music is a winner takes all profession. Because the amount of music the world will financially support is drastically lower than the amount of music people desire to make, and because music can be duplicated for free and played anywhere by anyone, the value of the commodity of music is under constant downward pressure. The US Bureau of Labor Statistics estimates that there are 167,400 jobs in music in the United States. The description given in the Occupational Outlook Handbook seems to imply that all musical professions are included in this figure, including conductors and composers, who occupy only a tiny percent, as well as performers, who are a bigger group, and finally teachers and other professionals. Jobs in music are expected to grow slower than the national average—meaning that opportunities are contracting, not expanding. Wikipedia lists 170 colleges and universities in the US with music programs. Some are institutions of music, others are larger universities with smaller music departments. There may be no exact estimate of the number of people earning music degrees per year. But if the average amount of new music degrees minted by each college is 250 per year, that’s 42,500 music graduates created per year. At this (guessed) rate, the amount of musicians needed to fill the country’s 167,400 music jobs would be reached every three years, and over the course of a 40-year career it would seem that the market is saturated with as many as 10x the number of musicians that the market demands. And this estimate only includes musicians who graduated from music programs. Many would-be musicians do not see a college education in music as the key to their career success. Although this is only a guess, it’s pretty hard to guess these numbers into a rosy equation for musicians. Add to that the fact that America is a world leader in music and film. Musicians from all over the world come to America to find opportunities they wouldn’t have back home. And that means more competition. In short, most people with music degrees don’t work in music, or don’t for long. When we think about a talented young person receiving the scholarship award that allows them to fulfill their dream, we are filled with a hopeful feeling that dreams are something that can be chased and caught. But most people who have a dream of being a musician will also live to dream of many things, from writing novels to designing robots. For many people, one pursued dream is another undiscovered—especially if the path to that first dream is paved with anxiety, difficulty and disappointment. Our encounters with success and failure have the power to affect our total life energy output. A 10 year struggle to earn a living in the most competitive business has the potential to drain that energy—affecting not only our success in the field of music, but also our ability to adapt and thrive in any path chosen later on. While many might argue otherwise, it does no great service to society to make the path to a degree in music easier to achieve, if doing so displaces people from professions where they could contribute more, and places them in professions where they will stand idle and wallow in frustration. If there is an exception, it must be for talented, motivated and determined individuals who face closed doors that were open to their more well-heeled counterparts. One could argue that society would benefit from more musical training as a part of the general education available to everyone. That’s because learning music has many extraordinary benefits that everybody can enjoy. If this fact were better recognized, and music education programs were well-funded throughout the United States, the need for highly-trained musicians would expand and could perhaps encompass much of the excess of supply. A nation trained in music is a nation with diverse tastes, giving support for good music in a wide variety of styles. The bottom line, however, is that society does not benefit from having extra unemployed musicians. There is another paradox facing potential music students. Success in music demands a high degree of skill. Cultivating this skill takes many years. In many professions, learning the basics in college makes a worker useful enough to hire, with the remaining experience being acquired on the job. Some professions can be entered after completing a short training program. Musicians normally spend many thousands of hours practicing before they begin to reach maturity. There are a number of intensive degree programs that offer a fast-track to a new career. Many of these programs can be completed in just one year. This is not at all so in music. Musicians are expected to display a high degree of skill at any audition. This means that students graduating from music programs will need to reach an enormous level of ability before graduation, or there will be a proficiency gap after college, where more practice and development is needed, but the time to do this work is not available because bills must be paid. In most professions, a proficiency gap is expected; workers are hired directly after leaving college and trained on the job. But it will be hard to find someone willing to pay you to continue your musical training. Based on my current proficiency level and the amount of added ability I am likely to acquire during college, will I be prepared to work professionally immediately after graduation, or will I still have more work to do? The answer to this question can be illuminating. It usually takes more than four years to make a musician. Taken as a whole, musicians live extremely difficult lives. And since many have no reliable income, they often pay their bills through low-wage jobs. This puts them through the same difficulty of America’s lower class, but with the added challenge that they are doing what they do so they can pursue their “real” goal of being a full-time working musician. While many people in America struggle to feed their children, others struggle to feed their musical passion. Gigs are sparse. Competitors will bid a gig all the way to the floor, even playing for free for a chance to establish their name. It is certainly possible for a musician to make a living through combining many sources of income. But the economic output of this formula is simply not equitable when compared to other career paths. A talented and hard-working person can enjoy a happy and secure life in most specializations. In music, merely getting by is an uncommonly happy ending. Income sources include music education work such as private lessons, classes and clinics; involvement with the design, endorsement or retail sale of musical instruments and accessories; concerts and performances; recording studio work; licensing music to sync with multimedia, and more. In the game of building a career as a professional musician, all of these are fair sources of cash. And while aspiring musicians have high hopes, sometimes viewing one path as more noble than the other, experienced musicians know that making a living in music is not easy. Even some of the best and most highly-trained musicians often spend years being subsidized by their family—or grants in the case of a few who have cultivated extraordinary talent. For anyone with immediate pressure to become self-sufficient, the musical career path is highly questionable. It’s important to acknowledge that not every decision will be made on an economic basis. Those of us living in advanced countries are fortunate, because a degree in performance, poetry or pottery is not necessarily a death sentence. We live in a society that tends to recognize that people are complex and that creating a workforce with a diverse array of skills and perspectives is a good way to build a powerful organization. Because of this, there are many people with degrees in the arts that are doing meaningful (and well-compensated) work, both within the field of music and outside of it. In some cases, your musical experience can earn you respect and credibility. In fact, it may open the door to many opportunities you had never thought of before. Imagine that this article was titled, “Should you have children?” It is unlikely that this question would revolve solely around financial details. From a financial perspective, bearing children is a bad idea. People do not have children to get rich, nor do they pursue a career in music in order to find financial stability. If you wish to dedicate yourself to the pursuit of music, you should prepare yourself for the results that come from choosing a specialization for non-financial reasons. Do You Need To Earn Money The Same Way You Spend It? One question you should ask before pursuing a career in music is whether you need to earn your money from the same thing you like to spend it on. If you add up the time that aspiring musicians do self-promoting, traveling, hunting for gigs, or supporting themselves at other jobs you might find that the non-musical responsibilities are a full-time job themselves. This puts many musicians in a position of low-power productive output. From this perspective, it doesn’t make alot of sense to spend so much of your time doing volunteer work and working for low wages when you could find a more reliable source of income, and then spend the rest of the time on your music. What if you could learn an in-demand and non-musical skill that could earn you $50 or more per hour? Then you could work 15 or 20 hours per week to pay your living expenses. And you'd have the remaining time to invest in whatever you like. When considering what you want in your future, think creatively about the strategy you use to get it. What is Success in Music? For anyone considering a career in music, it is important to think clearly about what it means to be a successful musician. Imagine yourself in the future, enjoying all of the success that you had ever dreamed of. What does that entail? Which of these details are absolutely necessary for success, and which of them are unnecessary extras? One enormous mistake that many people make is to lump all of these achievements into one category and call it “success”, something hopefully to be achieved at a later date. This is beyond foolish. You don’t need to “have it all” to be satisfied. And even if you did, you might not want it anymore. Starting with the list above, make your own list and rank the importance of each factor. Do you need all of the things on this list? Contrary to being complements to each other, many of these factors of success can be mutually incompatible. What if you became very famous, but you had no freedom left to live your own life? You can’t get a moment’s peace. You can’t even order a sandwich without being harassed and photographed. Every stupid thing you do is recorded, widely discussed, and documented forever. After the fallout from one racially-insensitive tweet, John Mayer’s heart sunk so deep into his chest that he had to retire to a small town for a year or two to get it out of his system. If you pursue only prestige and career highlights, you might win industry awards and the recognition of experts. But it is not certain that you will earn the money you need to live. Prestige does not equal money, and in fact it is sometimes used as a form of payment instead of money. Imagine your perfect day. Now think about your day-to-day life as a musician. Do they match? Too often we buy into a career based on its perceived benefits, without imagining how it will shape our daily life. There are many cases of extremely famous stars who struggled with financial difficulty because of their inability to manage or keep proper control of their assets. All things considered, famous actors and musicians do not appear to be more happy than the general population. In fact they often struggle with addiction or mental illness. Money does not need to come from music. The amazing thing about money is that all dollars are equal. Your landlord doesn’t care where your rent money came from. Think carefully about this list. Which of the things on this list do you want, and which could you go without? How can you build that life, which has everything you want? Is your goal a crude and idealistic dream, or a refined and carefully-developed plan? There are many paths, but they all lead to the mountain top. Despite the bleak picture it paints, this article is not intended to dissuade everyone from pursuing a degree or career in music. Only those for whom it is not a good fit. It’s a difficult path and it’s not for everyone. For the highly determined and motivated, there is no alternative. But if you’re not sure, then it may not be right for you. If your skin is thick enough to face the truth about why it’s not the best idea to go to music school, but you can’t see yourself doing anything else, then maybe you have what it takes. If it’s your destiny to go to music school, then you probably read everything here and didn’t flinch. It doesn’t matter what anybody says on the Internet. you’re going, and that’s that. The road to success is littered with the corpses of those who didn’t make it. But there is only one way to guarantee that you won’t make it as a musician, and that is by never having tried. If there weren’t musicians willing to face financial failure, disappointment, stress and anxiety in order to fulfill their dream, then we wouldn’t have any good music to listen to. Hearing great music is a wonderful privilege, and for that we owe a great debt. Not only to the few who succeeded, but also to the many who tried and ended up somewhere unexpected—or didn’t make it at all. 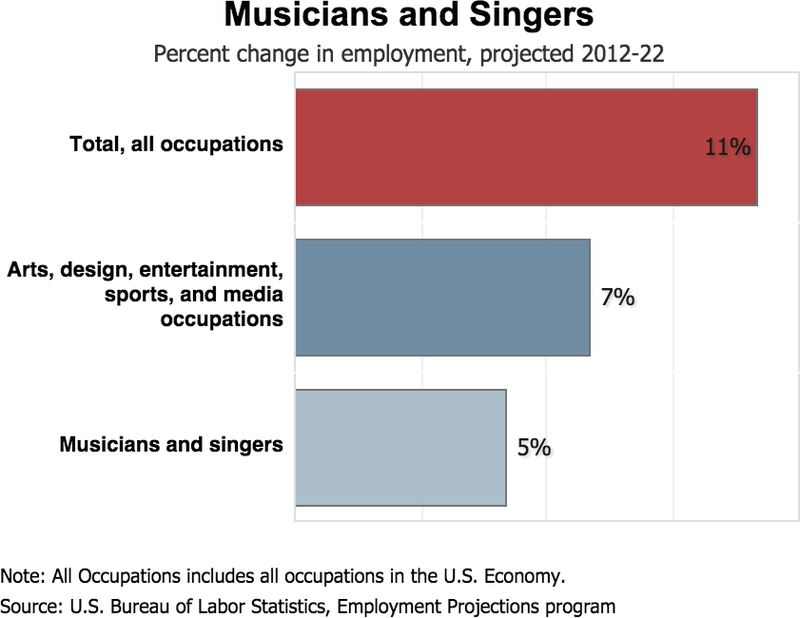 Occupational Outlook Handbook: Musicians and Singers — US Bureau of Labor Statistics. Accessed September 21 2014. List of College and University Schools of Music — Wikipedia. Accessed September 21 2014.